Apart from the one plant that has mildew, I’m really happy to report that my Lavender Plants are coming along. They have grown a bit taller and slightly bushier in the past month probably because of the great sunny weather we have been having. I’ve sprayed the mildew affected plant against fungal diseases and need to repeat that every seven days, three times. We will see what happens to it. Happy gardening. 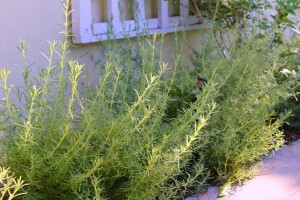 I would love one of those Margaret Roberts lavender in my garden but alas, not enough sun here because of all my trees. I also haven’t seen them at any of the nurseries I go to … if I ever do see one I will buy it and try it somewhere in a sunny spot. Hey! Great to hear! You know this is my favourite plant! The wispy french lavender is perfect for your garden. I don’t think they grow as big as the Margaret Roberts lavender I have growing in my garden. I have to tell you that I have tried the French, the Dutch and the Spanish lavender and the only one who ended up thriving was the Margaret Roberts lavender!